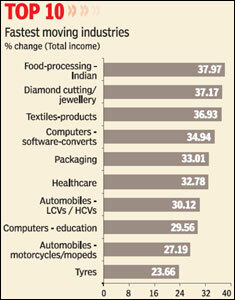 Among the industries (79) studied, only 16 showed negative growth in their total income during 2009-10. Mention may be made of aluminium and aluminium products (-8.35%), electronics consumer (-6.75%), fertilisers (-24.21%), oil & gas (-1.3%), real estate (-12.82%), shipping (-4.86%), steel large (-17.52%), sugar (-4.67%) and transport airlines/travel agencies (-3.01%). All the other 63 broad industry categories under which the FE 500 had been clubbed had positive growth to show. As always, aggregates tend to conceal some real good or bad performances. Thus, even though auto ancillaries showed good income growth of 23.34%, Rane Holdings grew at the higher rate of 42.84%. The group average was also weighed up by the 25.14% income. The net profit of Subros, one of the biggest auto ancillaries companies, increased by 58.80% during 2009-10. 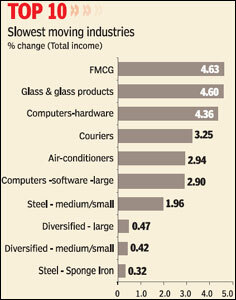 Similarly, engineering industry saw 15.02% per cent income growth. But at least three engineering companies namely Engineers (I), Tecpro Systems, and McNally Bharat Engg. reported more than 23% increases. The net profit of the engineering group of companies increased by 36.44% to Rs 6,668 crore during 2009-10. Among the industries studied, the best performers of the year were construction, automobiles-LCVs/ HCVs/passenger cars, cement, entertainment/electronic media software, computer-software-mega, pharmaceutical bulk drugs and formulations and tyres. Given below is a brief synops is of the major gainers and losers of 2009-10. Construction: The industry showed excellent results with positive growth rates in all financial indicators. While total income increased by around 19.06%, net profit went up by 91.46%. And the retained profit of the group increased by 112.34%to Rs 3,343 crore during 2009-10. And the debt-equity ratio increased from 2.08 during 2008-09 to 2.34 during 2009-10. Jaiprakash Associates, Lanco Infratech, Nagarjuna Construction Co. and Era Infra Engineering were among the best performers. Due to the global financial crises, the fiscal year 2009-10 began as a difficult one. Core industries and infrastructure services, led by the robust growth monentum of telecom services and spread across power, coal and other infrastructure like ports, civil aviation and roads, have also shown signs of recovery in 2009-10. The core infrastructure industry grew by 5.5% in 2009-10. The stimulus measures announced by the national authorities worldwide to combat the economic slowdown contained infrastructure buildup plans. The Central and state governments are focussing on establishing an appropriate policy framework for the infrastructure sector which provides the private sector with incentives to make large-scale investments, at the same time preserving adequate checks and balances through transparency, competition and regulation. The government has undertaken a series of legislative, administrative and executive initiatives to minimize infrastructure deficit, ameliorate bottlenecks in completion of projects and nurture core industrial and infrastructure services. Automobiles LCVs/HCVs/Passenger Cars: The industry reported significant growth in total income. And industry's profit turned out to be positive during 2009-10. The net profit and retained profit of this group was Rs 5,763 crore and Rs 4,508 crore respectively during 2009-10. The stars in the group were Ashok Leyland (122.98% growth in net profit) and Maruti Suzuki (113.84% growth in NP ). The debt-equity ratio of the group decreased from 1.87 during 2008-09 to 1.52 during 2009-10. After a sharp drop in 2008-09, recovery in the economy, the government's stimulus package and easy finance rates helped the CV industry record 38 per cent growth in domestic sales during 2009-10. Within the CV segment, Light Commercial Vehicles (LCVs) posted a 43% growth, while the M&HCV segment grew 34%, LCVs contributed to about 54% of the overall commercial vehicle segment, compared to 52% in the previous year. Passenger vehicle industry also grew by 26% after flat sales the previous year. FMCG: This industry reported positive growth in all financial indicators, with net profit (NP) growth of 22.19% per cent during the year 2009-10. The retained profit of this group also increased by 56.78% to Rs 2,683 crore during 2009-10. Nestle (I), Godrej Consumer Products, Colgate Palmolive (I), GlaxoSmithkline Cons. Health and Gillette (I) did well during the year. The better performance of Godrej Consumer Products (I) is reflected in the net profit growth of 96% during 2009-10. The retained profit of the company also increased by 204.11% to Rs 213.73 crore during 2009-10. A large amount of the growth is contributed by volume expansion which is an indication of rising demand and consumption. Higher raw material prices, rising food inflation and increasing competition may impact margins of some products but overall there is significant opportunity in this space. According to a FICCI-Technopak report, despite the economic slowdown, India's FMCG sector is poised to reach $43 billion by 2013 and $74 billion by 2018. Cement: The cement industry showed somewhat better performance in terms of sales during 2009-10 with total income of 15 major cement companies increasing by just 16.51% but net profit increased by 21.25%. The higher profitability of the cement companies during the year 2009-10 has been due to increased infrastructure spending as part of stimulus measures, solid demand for housing in rural and semi urban areas and low cost housing initiatives. This is reflected in the performance of ACC, whose net profit increased by 42.22% during the financial year 2009-10. The retained profit of the company also increased by 56.31% to Rs 1132.15 crore during 2009-10. Indias cement industry recorded a growth of 9 to 10% in the year 2010 in the Indian economy. The prices of major inputs for cement viz coal, slag, gypsum, fly ash and petroleum products have started rising and are likely to harden in the near future. Supply of railway wagons is likely to worsen affecting cement despatches to some markets. Government's continued thrust on infrastructure and its stimulus packages to boost rural and other sectors are likely accelerate construction activity. So the demand for cement will grow steadily in the next few yeras. Engineering Turnkey Services: The industrys (11 units) total Income increased by 19.23% and net profit increased by 22.19% during the year 2009-10. BGR Energy Systems, Elecon Engineering and Hindustan Dorr Oliver experienced a significant increase in total income during the year 2009-10. Among these three companies, highest increase in total income (80.13%) was seen in the case of Hindustan Dorr Oliver. The debt-equity ratio of this group increased from 0.57 to 0.64. As per NASSCOM, based upon the growing depth and breadth of services, flexible business models, large engineering base and global footprint with greater proximity to customers, India is continuously expanding its service portfolio to cover the full spectrum of product development value chain. India's engineering expertise is going beyond redesigning products to reengineer the production processes and business models to meet the needs of the domestic market. Further Indian engineering R&D services market is expected to reach USD 40-45 bn by 2020 with exports revenues at about USD 35-40 bn and domestic revenues at USD 4-6 bn. In terms of industry verticals, infrastructure, aerospace and energy are expected to contribute-80 per cent of the domestic revenue. Computers-Software Mega: The aggregate total income of the industry (8 units) increased by 8.32% to Rs 1.09 lakh crore in 2009-10. The net profit of the industry showed an increase of 15.43% during the year under study and the retained profit of the industry increased marginally by 1.40% during the year 2009-10. Infosys Technologies, Patni Computer Systems, TCS, Mphasis and Wipro were among the star performers. The net profit of Mphasis and Wipro increased by 84.56% and 18.75%, respectively during the year. Companies had reduced IT spending either by delaying the decisions or by putting some discretionary spending on new IT projects on hold in the first half of 2009.
e) workload management and f) cutting down on cycle time and increasing speed to market. Pharmaceuticals-Indian-Bulk Drugs & Formulations: The industry has performed better in terms of net profit in 2009-10, with aggregate total income of 13 companies rising by 8.27% to Rs 43,367 crore during 2009-10. Net profit and retained profit increased by 188.12% and 294.16% respectively during the same period. Companies like Cipla, Glenmark Pharma Sun Pharma and Ipca Laboratories had done well during the year. The debt-equity ratio of the group marginally decreased from 0.66 in 2008-09 to 0.48 in 2009-10. According to directors report, the Indian pharmaceutical market has seen a CAGR of about 14% in the last five years. It continues to be highly fragmented and dominated by Indian companies. The domestic pharmaceutical industry grew by 18% in March 2010 (ORG's moving annual total, or MAT) versus 10% in March 2009. The government of India's Vision 2015 statement indicates an 18% plus CAGR for the pharmaceutical sector, translating to a doubling of revenues over the next five years. Growing lifestyle disorders, particularly metabolic disorders like diabetes, obesity and hypertension, coronary heart disease, cardiovascular, neuropsychiatry and oncology drugs are likely to gain significance. Sugar: The industry has done somewhat better during the year 2009-10, with aggregate income decreasing by 4.67% to Rs 20,985 crore in 2009-10. Net profit and retained profit increased significantly. Net profit and retained profit of the group increased by 11.49% to Rs 1,289.78 crore and 11.82% to Rs 1,036.89 crore respectively during 2009-10. Companies like Shree Renuka Sugars, Triveni Engg. & Inds, Bannari Amman Sugars and Balrampur Chini did well during the year. The debt-equity ratio of the sugar industry decreased from 1.77 during 2008-09 to 1.35 during 2009-10. The net profit of Shree Renuka Sugars increased by 90.28% to Rs 224.78 crore during 2009-10. The Indian sugar industry is one of the largest agro based industry. It has significant standing in the world sugar market. The industry is regulated by the Central/State Governments by means of mandated command area, formula based pricing, monthly release mechanism, import-export policy, free sugar policy etc. The Sugar Season 2008-09 ended with a Sugar production of 14.6 million tonnes. This is primarily due to lesser availability of sugarcane, resulting in a huge gap between domestic production and demand. The prices of both raw sugar and refined sugar were ruling high in international market untilFebruary 2010. With the expected high production in Brazil and also improvement in the availability of sugar cane in India, the price of sugar has softened to certain extent. The Government has estimated sugar production to be around 17 million tonnes for the sugar season 2009-10, as against the consumption of 23 million tonnes. The Central Government has increased the levy quota to 20% of the sugar production (as against the 10% in the sugar season 2008-09) with effect from 1st October 2009. The Government has also introduced FRP in the place of SMP. Telecommunications-Service Provider: The industry has not done well in 2009-10, with aggregate income rising by 6.38% to Rs 98,506 crore in 2009-10. Net profit and retained profit decreased dramatically. Net profit of the group decreased by 27.94%to Rs 11,081 crore during 2009-10. Companies like Idea Cellular, Bharti Airtel and Tulip Telecom, did well during the year. The net profit of Bharti Airtel increased by 16.59% to Rs 9,163 crore during 2009-10. According to directors report , the Indian telecom sector continued to register a robust growth in the financial year 2009-10 and added 191.55 mn new connections between April 2009 and March 2010. The number of telecom subscribers in India reached 621.28 mn and the overall teledensity reached 52.74% at the end of March 2010. Subscription in urban areas grew to 420.51 mn, recording an annual growth of over 37% and taking the urban teledensity to 119.45%. The wireless segment grew by 49% during the year reaching 584.32 mn as on March 31, 2010. Broadband subscriptions also reached about 8.75 mn at the end of March 2010. Tyres: The industry has performed significantly well in 2009-10, with aggregate income rising by 23.66% to Rs 25,295 crore in 2009-10. Net profit and retained profit increased dramatically. Net profit of the group increased by 429.33% to Rs 1,578 crore during 2009-10. Companies like Apollo Tyres, MRF, Balkrishna Industries and Goodyear did well during the year. The net profit of Apollo Tyres increased by 369.53% to Rs 653.35 crore during 2009-10. The debt-equity ratio of the group decreased from 1.07 to 0.81 during 2009-10. According to directors report, to combat the rising cost of raw materials, some of the manufacturers were forced to undertake price hikes during the second half of the year 2009-10. A robust demand provided support externally, while upping internal efficiencies further countered rising costs. While the anti dumping duty imposed on trucks-bus radial tyres from China and Thailand favoured the industry, the increase in excise duty by 2%, post the Union Budget, impacted profitability in the last quarter. The Indian tyre industry was definitely back to operating at its full capacity in 2009-10.